Most of Serbian politicians have greeted today Donald Trump’s victory in US presidential elections. Hillary Clinton is very unpopular in Serbia mostly because of the fact that US have bombed it while her husband Bill Clinton was American president. On the other hand, Trump’s popularity is based in disputed reports that he had apologized Serbia over 1999 US air campaign against it. 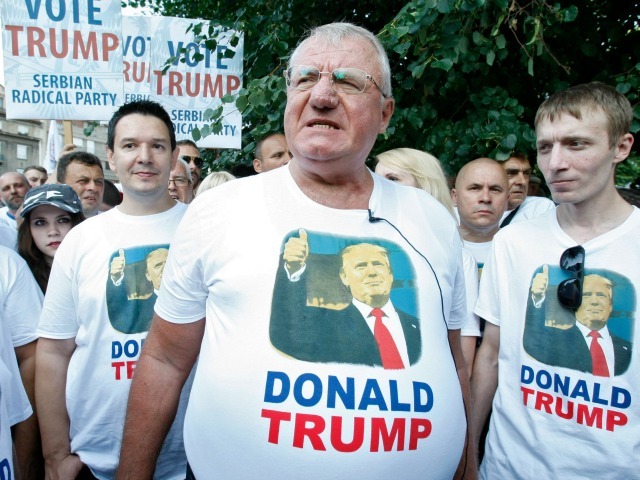 Prime minister Aleksandar Vucic and Serbian Radical Party (SRS) leader Vojislav Seselj have congratulated Trump, while president Tomislav Nikolic said that Serbia have “great expectations” from newly elected US president. Vucic, Seselj and Nikolic, former longtime allies, have split in 2008, when Nikolic and Vucic abandoned Seselj’s far right SRS. “If the rhetoric before the elections was not fake, we can expect better cooperation between Russia and USA, better understanding for Serbia and its stance of non-recognizing so called Kosovo and not joining sanctions against Russia”, Nikolic underlined. Premier Vucic said that he has “noticed general enthusiasm” in Serbia over Trump’s victory. He added, however, that he would like people to be focused on their own problems. “Serbia wants the best possible relations with America and, unlike others, we have not been meddling in US elections and have considered them as internal affairs of Americans… That’s free will of American people and we didn’t support any candidate for a second”, Vucic said. But according to some reports, Vucic was earlier predicting that Hillary Clinton would win the elections. In August he took part in Clinton Foundation conference in New York. Former Srebrenica mayor Camil Durakovic and Vucic then spoke at the panel moderated by Bill Clinton. Opposition leader Zoran Zivkovic said that he did not see any reasons for celebrations in Serbia, adding that American foreign policy in the Balkans would not be changed.